The Henley Rowing Club Juniors recorded a magnificent 12 wins at the Bedford Spring Head on Sunday. Racing in one of the last Head races of the season, the Junior Mens and Women’s Squads travelled north to compete in 17 events across a range of boats and age groups. The first win of the day came from the Women’s IM3 coxed four of Alexis Perkins, Emily Pimlott, Kryssie Steiger, Kiera Buckley and cox Emma Lister. Racing the 2km course downstream through the town of Bedford, the crew were enthusiastically supported by a contingent of parents who stood on the various bridges spanning the river. Winning in a time of 7 minutes and 25 seconds, the crew beat 12 other boats in their event to start a cascade of wins for the Henley club. The Junior boys scored a brace of wins in their events. The J15 coxed quad of Sebastian Meyer-O’Kane, Simranjit Sandhu, Thomas Frost, Charlie Rollet-Manus and cox Jack Bond raced against 2 boats from Bedford School to command their event and win in a time of 6 minutes and 53 seconds. 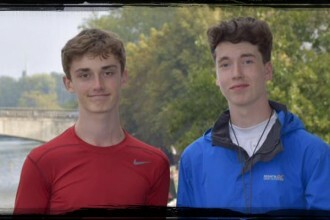 Thomas Frost and Charlie Rollet-Manus then raced to their second win of the day in the older J16 double event. Leading the three other competing boats, the Henley boys recorded a clear win in 7 minutes and 3 seconds. 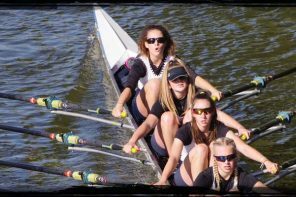 The Junior women’s squad then demonstrated their strength in both sculling and rowing to outclass many of the competing clubs from around the country. With most of the girls competing in two events throughout the day, the squad triumphed in another 9 events to bring the total number of wins to 12 for the Henley club. The WJ16 quad of Lauren Edwards, Maddie Orr, Ellie Thompson and Hattie Orr won their event easily and also were the fastest junior and senior women’s quad of the day in a time of 6 minutes and 48 seconds. Lauren Edwards then won the Women’s Novice single sculls event easily, Maddie Orr came a close second in the WJ16 single sculls, whilst Ellie Thompson and Hattie Orr combined in the WJ16 double to win their event and score the fastest women’s double time of the day. In other Women’s Novice events, the Henley girls scored a further 3 wins. The Women’s Novice quad event was won by the Henley crew of Katie Beale, Claire Pearson, Beth Pasco and Lily Stimpson. The Novice coxed four event was won by the Henley crew of Lauren Kay, Katy Claridge, Maisie Turner and cox Rebecca Lister. 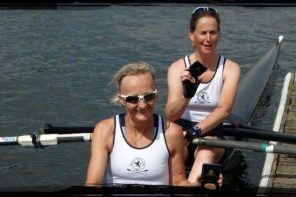 The Novice double event was won by the Henley crew of Florence Wiggins and Katie Beale. To add to the Women’s IM3 coxed four win, the Henley girls also won the IM3 quad event with a crew of Alexis Perkins, Kryssie Steiger, Emily Pimlott and Hannah Gutteridge. The WJ16 coxed four of Lauren Kay, Georgia Edwards, Maisie Turner, Emma Lister and cox Rebecca Lister won their event in an emphatic time of 7 minutes and 21 seconds. 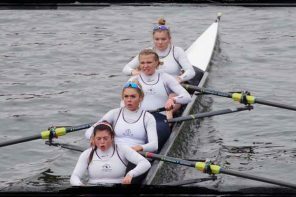 The WJ15 coxed quad of Ella Morgan, Katy Claridge, Hannah Gutteridge and cox Rebecca Lister won against the local Bedford Girls School in a time of 7 minutes and 12 seconds.